B Hotels & Resorts® introduces the first B Resort and lifestyle hotel to the Lake Buena Vista area, with a transformation of the former Royal Plaza hotel. A joint venture between InSite Group and Cube Capital, the B Resort, located in the Walt Disney World® Resort will open early 2014 and showcase 394 completely redesigned guestrooms and public areas that feature elegant yet playful decor, alluding to the surrounding destination and its imagination-inspiring attractions. Renovations are taking place throughout the property including the 25,000 square feet of function space, common areas, pool and outdoor terrace, and will introduce an innovative culinary concept and full service spa to the Downtown Disney® resort area. A complete transformation resulting in a new destination resort, the B will be a welcomed addition to the area for seasoned travelers, families and discerning adults looking for refined yet approachable lifestyle accommodations. The vision for B Resort's cutting-edge design and future programs calls for visitors to feel open to express how they aspire to be during their visit to the Orlando area. A balance between casual sophistication, lifestyle elements and innovative offerings has been struck through the artfully employed design details provided by a collaboration of VOA Associates Incorporated and InSite's in-house design team. Entering the newly redesigned resort, guests' senses are immediately activated with a specially developed scent of white tea and thyme. A cascading waterfall takes center stage in the majestic lobby, creating a relaxing environment. Spacious public areas are conducive to business and socialization with soothing and sleek interior decor, intimate and flexible seating arrangements, FreeB Wi-Fi (complimentary high-speed internet access), courtesy guest iPads and other available entertainment options. 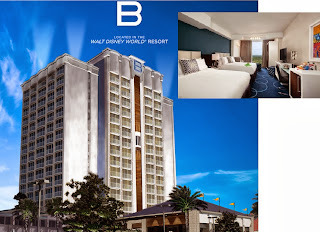 With its debut, the B Resort will unveil 394 completely renovated guestrooms within the 17-story tower and connecting Lanai building. There will be two Master Poolside Suites, five Master Suites, 17 one-Bedroom Suites, and 20 family-friendly rooms with bunk beds. Master Suites were designed with business executives and extended stay guests in mind and contain an expansive living and entertaining area with kitchenette or wet bar and formal dining space with seating for up to eight. All guestroom interiors fuse stylish and timeless designs and include a mini fridge, in-room safe, B Treated snack box, the latest high-tech offerings such as FreeB Wi-Fi, HD LED interactive flat-screen TVs, and electrical power hubs with USB, HDMI and international outlet plug ins. As part of B Hotels & Resorts'® B Humane program, all guestrooms come furnished with a plush green frog, that represents the native Florida Gopher Frog, a protected species. The frogs are available for "adoption" to take home at check out, with a portion of the sale's proceeds donated to a Florida environmental foundation. In an evolving relationship with Jeffrey Chodorow of China Grill Management, B Resort's farmhouse chic signature restaurant offers an innovative culinary experience that redefines classic American barbeque. A cross-country selection of BBQ favorites, smoked meats, fish and poultry will be offered both from an a-la-carte menu and an original buffet presentation. Through a large window in the restaurant, diners can peek in on the action and watch as the culinary team smokes mouthwatering meats and rotisserie chicken. Other food and beverage outlets at the resort include a poolside bar and grill and a grab 'n go cafe with an ice cream parlor. The first full-service B Indulged® spa will make its debut at the B Resort in Lake Buena Vista and add to the overall resort-style environment. A perfect respite after fun-filled days at the parks or rigorous meetings, the spa includes four treatment rooms, including one for couple therapies. The serene design palette features upholstery and accent pieces shimmering with an opalescent patina, while a separate hair salon, nail boutique, relaxation lounge, men's and women's locker rooms, and B Active® Fitness Center complete the experience. Other amenities at the resort include four tennis courts, a zero-entry, mineral-water pool with multiple interactive water elements, private cabanas, outdoor fire pits for s'mores and more, kids programs, an interactive area in the lobby with games and Monscierge® screens (the interactive resort/destination guide providing guests with touch screen technology and access to maps, photos, restaurant menus and more), FreeB Wi-Fi throughout the property, valet and self-parking on site and complimentary shuttles to the Walt Disney World® Resort theme parks. Over 25,000 square feet of flexible function space, including two ballrooms, divisible into nine breakout rooms, and a poolside terrace and courtyard, make the B Resort an ideal venue for meetings, events and weddings when it opens in 2014. Catering menus will be designed by China Grill Management, and a separate banquet kitchen allows for the hosting of kosher and other culturally authentic functions. The Grand Ballroom accommodates up to 1,000 guests in theatre style and up to 750 for banquets. Dark espresso wood finishes and textured wall coverings are offset with sparkling crystal drop chandeliers, and provide an overall neutral backdrop to complement any specially designed event decor.